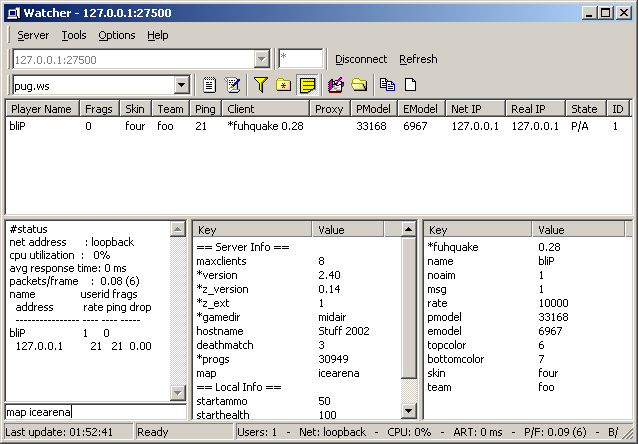 QuakeWorld server administration program for Windows 9x/ME/2K/XP, compatible with nearly all server versions from QW2.33 to the latest MVDSV (disable encrypted rcon). Watcher is my second GUI application. It started out as a small console-like program called "boot" which only looked through player's userinfo for cheat client strings to ban them, shortly afterwards the capability of logging players was added and renamed to "Watcher". Then an interface was added and the watcher you know of was born.